Tony Franklin "broke his silence" in the Montgomery Advertiser over the weekend. I'm sure every other Auburn blog will mention Josh Moon's story, which you can read in it's entirety here. It's going to raise a few eyebrows but after reading and re-reading and going over Josh Moon's piece, I can honestly say: Auburn made the right choice in letting Franklin go. The article itself doesn't really have anything new to say about the Franklin Saga. But it basically boils down to 3 main points about Franklin: 1) Franklin had reservations about taking the job 2) Franklin was considered an outsider to the rest of the staff 3) Franklin loves the Sunbelt and is glad he out of Auburn and then has about 3 main bullet points about the former Auburn staff: 1) they didn't trust the administration 2) they didn't trust each other and 3) they were worried about Nick Saban. Rather than break down the article piece by piece like I've done in the past, I'd like to revisit the "Tony Franklin Spread" and talk about why it was the wrong choice for Auburn. 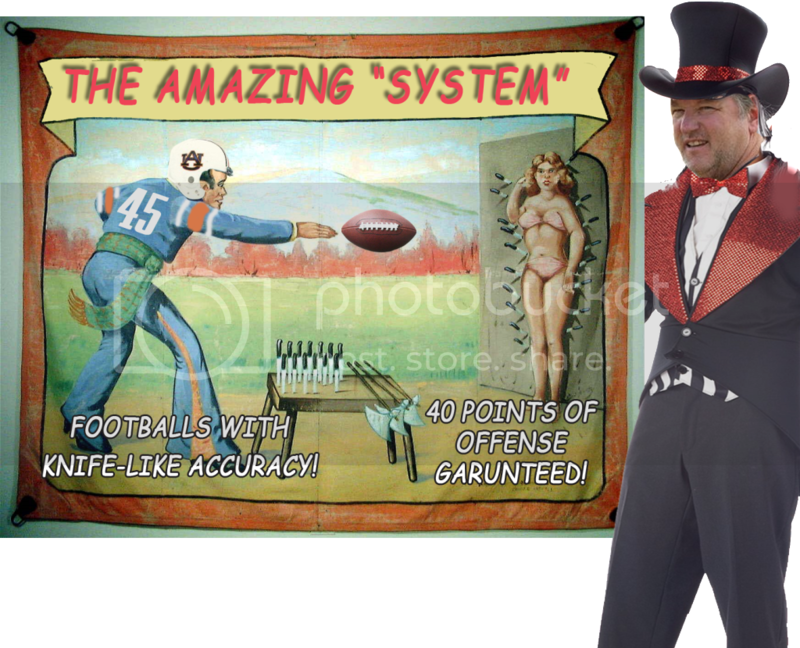 Why it failed at Auburn, and ultimately, why Tony Franklin and his "Snake Oil Offense" can't truly be trusted. Before the 08 Season began, I was all about some Tony Franklin. The interviews I sat in on painted him as engaging and cocksure and I saw first hand what he was able to do at Troy. But in reality, Tony Franklin is a whiny doubter who plays the "outsider" card to feel like a braggart. "I don't have anyone on that staff that I'd call a friend now," Franklin said. "I never fit into that group. I was never welcomed into that group. And that's fine. When I was brought in, they did what they thought they should be doing to help me. When things weren't working, they started doing things like they'd always done them, because that's what they knew. "That's all they do is pray -- and talk about praying and religion," Franklin said. "It's a constant thing with them, and it's just overwhelming at times. A lot of people use religion as a crutch, and I think that's the case there. Every word coming out of their mouths is something about religion, and most of it is just a joke. "I don't want to come off as anti-religion or that I'm not a Christian, but the best people in the world -- the ones who do truly great things -- they just do good things for people. You don't know most of the time if they're Muslim or Christian or anything else, because they never talk about it. But it was constant with them, and it was uncomfortable sometimes. When you talk about your religion so much, it comes off as fake or phony. That's the way I think of several of those people (at Auburn) as fake." His current job is ideal, Franklin says. He gets to do on-the-field coaching and teaching. "All the good, and I don't have to handle the bad — dealing with parents, administrators. ... The biggest thing I miss is the camaraderie with a staff. He misses the "camaraderie". Camaraderie I’m sure he felt to some extent at Troy and thought he might get at least a bit of a Auburn. But also notice what he calls the "bad". Dealing with Administrators, Parents, etc. I'm sorry but that's a part of Coaching. It's more than the X's and O's as they say, It's about the "Johnnies" and the "Joes". But Franklin talks about wanting camaraderie but still holding on to that ideal that he's an outsider or "hired gun"
I've enjoyed working with Tommy (Tuberville) and the fact that it's one of those situations like I was used to with coach (Larry) Blakeney. I know I have a job, and he allows me to do that job. I think that makes my life a lot better. I've been an entrepreneur and I've worked for myself, and I don't need somebody to point me where to go and what to do. I know how to go to work, and I need that freedom to be able to do my job, and he's given that to me. It's been fun." That’s Franklin himself, six months into the job. Talking about what he’s enjoyed about it. I wasn't going to sit and watch it all sink with my thumb in my mouth. I was going to take every approach I knew to make it work. And I really think it worked." Franklin went out for practice that day and "coached every position on the field like I was 25 years old again. I was running routes the best a 51-year-old can run them. I think I got most of them back." "Coach Tuberville made the statement that this was my offense," Franklin recalled. "He said they needed to jump on board or find somewhere else to go." "There were some things the players and coaches needed to hear about being responsible. I had owned up to my responsibility and publicly tried to take the blame every time I was asked. It was time for them to do the same. "They were doing what was best for them. You can't blame them for any of that, for the way they reacted to me or anything." It doesn’t happen both ways. You can’t sit and say you want to be left alone as a head coach, then when you’re offense is failing, decided that THEN is the time to react. Telling all these coaches, who have been together around 10 years that the job they are doing is WRONG. That they can’t coach and here’s the “hired gun” to take care of it. Watching Tony Franklin pack his car in front of the complex after being fired. That’s from Jay Tate’s HABOTN. Notice the red text. But let’s be honest the real problem is this: TONY FRANKLIN COULDN’T COACH. This works very well in high school and at the Division II and Division I-AA level of college football because at that level teams don’t have the numbers on defense. It’s more difficult at this level because the good teams are so deep in defensive linemen. What coach would legitimately buy into an offense that’s main proponent says “might have a chance in a fourth quarter”? That’s not exactly exuding confidence. Business is good — he has grossed approximately $170,000 this year. His initial consultation fee is $1,500. He then charges a daily rate or a season-long rate if it is for the rest of the year. Franklin says about half the time, individual boosters or booster clubs pay the fees. That's fine for a school like Hoover, located in an affluent area of Birmingham, where 94% of the students go on to college and whose booster club raises more than $300,000 a year. But what about a financially challenged program? "Why get a consultant when they have me?" says Lexie Spurlock, who has coached for 12 years in Chicago's Public School League at Morgan Park. "Fees like that are not feasible at any Chicago public school." Friday night, Hoover lost to in-state opponent Tuscaloosa County 39-28. Both teams use Franklin's system. Franklin allows current clients to "blackball" an opponent from learning his system. its ridiculous, nit-picky rules and regulations on everything you do. Franklin is angrier with himself, saying he was seduced by the money and allowed his ego to get the best of him instead of "using common sense." First time I have read your blog. I am listing it as one of my favorite sites right now. Enjoyed the dissecting you did on Franklin. Thanks. First time reader Kevin - Great breakdown of Moon's article with past references to other Franklin statements. Seems he talks out of both sides of his mouth, doesn't he? Cajun and Loganville, thanks for the love. Hope to keep it going.